If you are moving to Australia, then you will most likely have need of an international currency exchange service (as well as general banking, and all the other things that make up such a big move). Like all services, when it comes to moving money, it is worth going with the best provider. There are many reasons it is worth shopping around when you need an international currency exchange service, from saving money, to convenience – all the way through just plan not getting ripped off. So, the question is whether ANZ is the service for you? The first thing that is worth looking at is the basic value of the service. We have weighed up a load of the best known companies for you to view and see how they stack up against each other. You can see this quite plainly below, and here. As you can see, though ANZ is a large, respected bank, this does not translate to value and it is not a recommended service. This comes down to a number of factors, but is generally focused on cost, as the big banks in general do not overall give as much value as the smaller, but service specific competitors when it comes to international currency exchange. One of the most important things to understand around international currency exchange, is the exchange rate. This is (obviously) the rate that you get your new currency against the old. This is where you get a deal, and it is also where you lose money. It all sounds like technicalities, the difference often being the odd percent here and there. But the more money you transfer, the more these percent add up to. 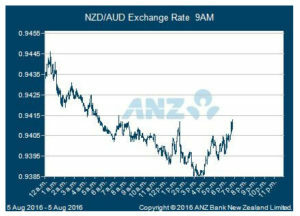 As you can see, we have ANZ international currency exchange rates given as “Fair.” This means that they are not a ripoff, but you can certainly find a better deal elsewhere! And most likely should. The reality is international currency exchange is that it is very complicated. Currencies are always in fluctuation, and no one can really predict what any one currency is going to do. This is another reason that services will give lower exchange rates, as it protects them against the market. Again, this is why specialists that are versatile and can run with the market end up giving better deals. You can see how the Reserve Bank of Australia rates the dollar here. Another way in which you pay is with transaction fees. This is a flat fee that you pay to use the service. If you are paying this, and getting a lesser exchange rate, then you are basically paying in two different ways – through the exchange rate, and then with a charge. Not all companies charge a transaction fee. Unfortunately, ANZ is one of the international currency exchange companies that do charge a transaction fee. At the time this review was written, this was a flat fee of $18 (though this can go up to $28 if you use their service in branch of over the phone). Though when you are trying to transfer hundreds or thousands of dollars this may not seem very much, it is still a charge that many others will not make you pay. On the brightside, ANZ’s international currency exchange service is fairly quick. They boast a maximum of two business days (or possibly faster), which is by most standards very quick. Even the fastest specialist firms will not get your cash moved any faster than one business day – so ANZ’s international currency exchange service is worth looking at if you are in a rush. There are many extra benefits when it comes to using ANZ’s international currency exchange service. For one they have stores everywhere, which means that you can easily make your order over the counter and get all the help that comes with this. Plus, if you are with ANZ or are considering joining them, there are all the extra advantages of having your financial transactions in one place – something the specialists cannot replicate. On top of this, their services are 24/7, so you can get your money moving any time of the day. Is ANZ International Currency Exchange for you? ANZ offer a fair service. For those that bank with ANZ, you may well be attracted to the convenience of using your bank to take on these services. And for those that are not used to moving money around, you will probably appreciate the chance to talk to someone about what you need and get any questions answered. They are actually quite competitive when ranked against other high street options. However, if you want to simply get the best deal possible and get more bang for your buck, this you will be much better off with a specialist rather than ANZ. There are companies that do what they do for a much better exchange rate, and without a transaction fee. Plus they will do it in either the same or better timeframe.